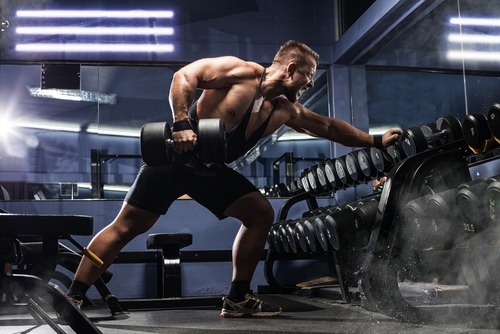 If your goal in the gym is to burn as many calories as possible, you want to make your workouts inefficient. This may not seem like it makes sense but the concept absolutely does when you think about it. Humans evolved over time to be as energy efficient as possible. This is the case for every living organism on the planet. Resources were scarce so we had to make the most of them. This means any additional calories we could gain from a few berries or an extra piece of meat were stored away as fat; this energy being scarce making it necessary to do so. In today’s society however, the western diet certainly isn’t stingy when it comes to calories. The facts are that most of us get more than enough calories that we need for the day, and end up storing the extra away as fat. Our weight loss goals are to get rid of that fat, so we need to work against that concept of conservation of energy. Being energy inefficient, or expending as much energy as possible to do a task, or in this case an exercise is the best way to go about burning off those extra calories. Most people would first think that the idea of making your exercise inefficient is dumb. You are wasting more energy to get the same work done but isn’t that the whole purpose of exercising to lose weight? To burn as much calories as possible? The best way to do this is to do additional exercises in between your usual sets. Expend more energy in the same amount of time that you used to. In addition to that, you want to make sure that the exercises you are doing in between sets are ones you are unfamiliar with. Again, this probably sounds counterintuitive at first, but it is going to take you more energy to do the exercises you aren’t familiar with than ones you are. Getting the movements down, the correct posture and performing the entire exercise correctly takes time and practice, and that takes more energy. When we first start incorporating these exercises in to our routine it is important that we ease our way in to things and don’t completely exhaust ourselves. When you exhaust yourself by over exertion or just exercising for too long, you tend to crash afterwards not doing much the rest of the day. This defeats the purpose of burning more calories so make sure you start out with a routine that correlates with how advanced of an athlete you are. A good starting exercise to do in between set is something called a front barbell squat. To do this exercise, you start in a standing position with a straight bar slightly above your chest and just below your clavicle. Hold the bar on your body by crossing your arms over the bar, letting it rest on your elbows. Then perform the squat as you would a normal squat, and repeat this for an additional 4 times. Do this for three sets total if possible. If you can’t do 3 sets do 2. Another great exercise for beginners is called a romanian dead lift. This similar to the normal dead lift in that you are starting with a straight bar on the floor and raise it up to your hips to finish. The difference between the two however is that the romanian dead lift involves rotation at the hips, you do not bend your knees here at all. Keep the bar as close to your shins as possible while slowly raising it up to your waist from the floor. The idea here is to isolate the hamstrings here, letting them do all the work. The first one you want to do is your typical dead lift which can be done with a straight bar or one specifically designed for dead lifts which wraps around the body. Do this dead lift like you would the romanian except that you’re going to bend your knees here as well. Bending the knees and hips engages the hamstrings, glutes and quads hitting your legs all over. The second one you want to use is a seated dumbbell press. The seated dumbbell press is going to work all 3 heads of your shoulder, your arms and your chest all at once. Do both of these exercises for 5 reps, 3 sets each if possible.